Now that the official White House Christmas tree has been delivered, the only question remaining is “What will the 2010 White House Christmas theme be?”. This decision is left up to the first lady, and had been since the JFK Administration. It was not until 1961 that the tradition of a White house Christmas theme began under Jacqueline Kennedy. Jackie, a lover of the arts, started a tradition of having a central theme for the White House Christmas season with her first theme of “The Nutcracker Suite”. This tree was decorated with ornamental toys, birds, and angels reminiscent of Petr Tchaikovsky’s “Nutcracker Suite” ballet, and placed in the oval Blue Room. The following year, Mrs. Kennedy recycled these delicate pieces, placing them with other ornaments of packages, candy canes and gingerbread cookies on the tree for her second theme, “Children”. All the ornaments were made by disabled or senior citizens craftspeople in the United States. Since this time, the White House has never passed through the Christmas season without a central theme for the house. 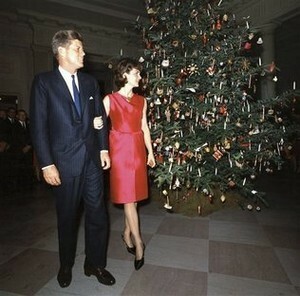 In the holiday photo above, Jacqueline Kennedy is seen wearing one of her iconic shift dresses from the 1960’s. This photograph, taken on December 12, 1962 at the White House Staff Christmas Reception, was when Jackie first debuted this deep pink dress, designed by Hubert de Givenchy. 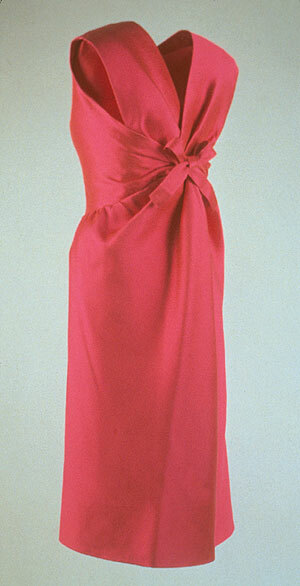 This sleeveless dress has a simple front, a classic look for Mrs. Kennedy, but the back of the dress consists of gathered material twisted together, forming a bow. It is now on display at the JFK Presidential Library and Museum in Boston, Massachusetts. How wonderful it must be to be the First Lady of the United States around Christmas time! She must feel so honored to be in charge of the theme in which all the decorations of the White House are designed around. These decorations and themes are truly a deeper insight to each first lady’s own taste and style, as well as a reflection of their and style! Known for her immaculate style, Jacqueline Kennedy has been admired by women around the world, not only since her first years in the White House, but also now, many years after her death. Jackie’s A-line dresses, clean suits, pillbox hats and elegant jewelry were an overnight success and quickly gave Jackie Kennedy the status of a world-renowned fashion icon. Her chic, sophisticated garments were imminent for setting numerous trends across the globe. Women from the 1960’s all the way to 2009 have wanted to look like Jackie Kennedy, dress like Jackie Kennedy, even desire to embody the essence of Jackie Kennedy. It is now possible to carry a small bit of Jackie’s style in your daily fashion. The Jackie Kennedy Jewelry Collection made available by Camrose and Kross, provides a wide variety of Jackie’s jewelry replicas, ranging from bracelets to earring, from necklaces to rings. 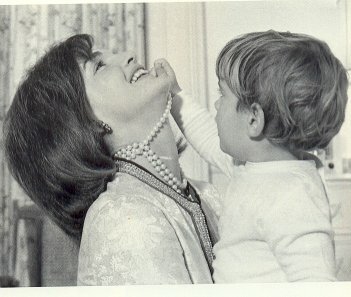 Despite the fact that Jacqueline was known for her expensive, European tastes, The Jackie Kennedy Jewelry Collection makes their jewelry affordable, as well as elegant. You can now dress as Jackie did on her wedding day, when she met with dignitaries, or simply enjoyed a night at home with her family. Do you like the idea of mimicking Jackie’s style? Are there any other first ladies’ styles you wish would be duplicated?